Most pilots have extensive flying experience prior to joining a new airline. Yet the time taken for these pilots to transfer onto a new aircraft type and be inducted into the airline can take as long as four to 6 months. Even when a pilot completes this training and is assessed as skilled enough to fly as an operational airline pilot, there still remains a continuing education and training program culminating with performance assessment throughout their career. During this recurrent training program numerous modes of instruction are available to an airline. Such training and assessment methods include classroom-based tuition, computer-based training, simulator-oriented flight instruction and real aircraft flight training. Although each mode has both strengths and limitations, there has been a tendency in airline training systems to limit change even when mode limitations have been identified. 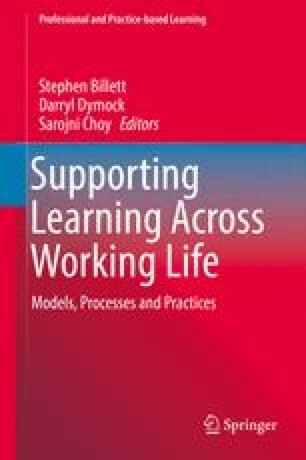 The aim of this chapter is to describe how one airline and a university-based research team have changed different modes of teaching/learning focusing more on reflective practice. I exemplify the change that arises from the collaboration in the context of two training methods and outline the strengths and weakness of each. Thanks to Michael Roth for his ideas and editorial assistance in the first draft. Appreciation goes to Ian Munro for his help in the development of the debriefing framework. Grimm, L. R. (2014). Psychology of knowledge representation. Wiley Interdisciplinary Reviews. Cognitive Science, 5, 261–270. doi: 10.1002/wcs.1284. Sheets-Johnstone, M. (2011). The primacy of movement. [DX Reader version]. Retrieved from http://librarycatalogue.griffith.edu.au/record=b1932512.